Fire Monkey: Fire creates passion, but can also produce irritation. Passion, quick wit and irritability are common to fire monkeys, and it will be common for this year in general. What is Chinese New Year all about? 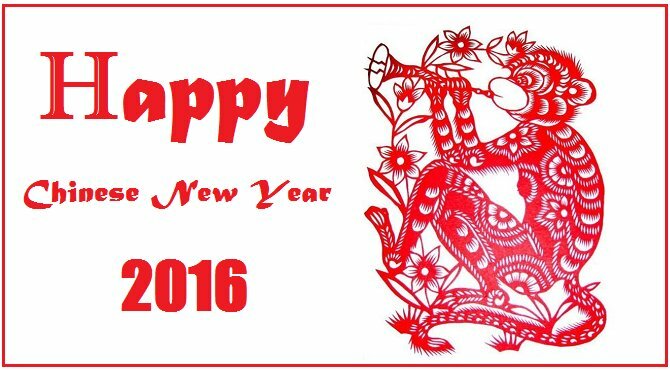 The Feng Shui new year is derived from the solar calendar and it always changes over February 4th-5th. This date denotes the Annual Flying Star energy change. Meanwhile, Chinese New Year, also known as the Spring Festival, is marked by the combined lunisolar Chinese calendar, so the date changes from year to year. The New Year usually begins in the end of January or in the beginning to mid-February, depending on when the new moon falls. There are 15 days of festivities, starting on New Year’s Eve. The culmination is the Lantern Festival, which takes place on the 15th day of the new year. Each Chinese New Year is characterised by one of 12 animals of the Chinese zodiac. The Chinese zodiac wheel is a little like the Western astrological Zodiac, except each Chinese animal marks a year, instead of a month. Apart from the fact that in Chinese zodiac each animal marks a year vs. Western zodiac, where each astrological sign marks a calendar month, there are other major differences. The Chinese zodiac also corresponds with the wheel of 8 cardinal and intercardinal subdirections of the compass. In addition, each of the 12 animals corresponds to one of the Five Elements. This energetic correspondence is registered each year twice (called Earthly Branch and Heavenly Stem) within the 60 year cycle of 12 animals multiplied by 5 elements. Each animal of the zodiac also has a correspondence to a specific Aspiration in the Eight Mansions (Lada Ray’s term: Eight Aspirations) system, as well as in the Chinese Numerology. I’ve begun the Chinese Zodiac page on LadaRay.info. CLICK HERE for complete Chinese Zodiac wheel and birth years for all 12 animal signs! 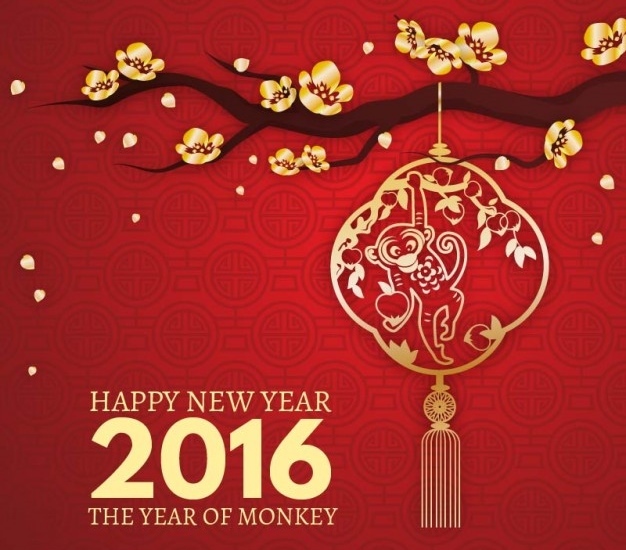 Year of the Monkey is always the 9th year of the 12-year cycle. 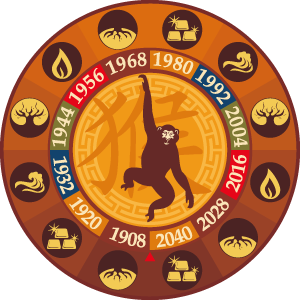 The next Year of the Monkey will be in 2028. Each year of the Monkey is different, depending on the element of the Heavenly Stem. Therefore, this is the Year of the Fire, or Red, Monkey. Such year is only repeated once every 60 years. Those who turn exactly 60 years of age between February 2016 and January 2017 are Fire Monkeys and they experience a full cycle return this year. First two-thirds of the year will be volatile and confrontational. Clashes and uneasy situation will continue throughout the world. There is a good chance that a more peaceful approach to international conflict resolution will prevail in the last third of the year, most likely starting in October 2016. I would like to note that this period coincides with the US presidential elections. 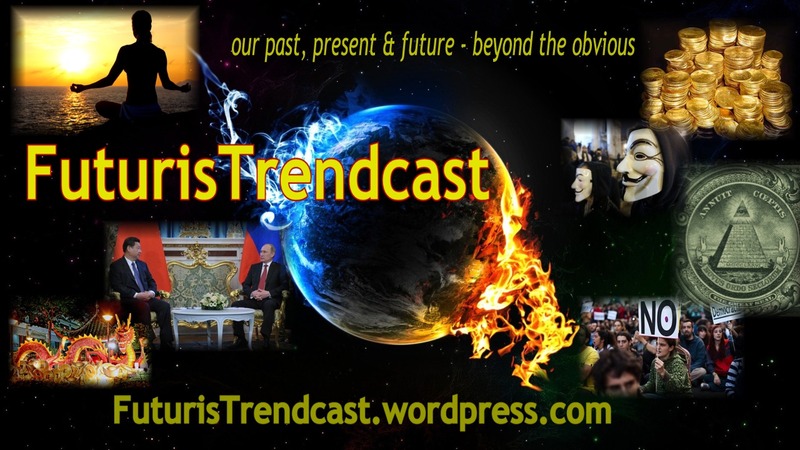 Those who follow my geopolitical analysis on FuturisTrendcast (FT) will see the direct correlation here. Will USA become more peaceful and inclined to negotiations after the elections? I will discuss it in my new PREDICTIONS on FT – coming later this year! Due to the #2 Illness Star flying to the center of the chart, this year is low in health energy, and rather sickly. Illnesses and epidemics scares are possible in various parts of the globe. This includes man-made viruses and hoaxes (Zika virus is a good example – I’ll talk about it in a separate article on FT). Everyone is advised to be careful, both while traveling and while at home! 2016 will be a sickly year for many people as the Illness Star is now in the center, its energy affecting all. Be careful not to get a flu, protect yourself by eating healthy, boost your energy via healthy supplements, and make sure you get enough rest this year. Energize your personal health direction and wear you personal health colors, according to Lada Ray’s Personal Feng Shui Empowerment & Success Report – see below! This year is very empowering for women due to (not to get too technical) No. 8 White Star flying to SW, the place of the woman. Women will greatly benefit from energizing their SW corner with 8 smooth yellow calcite or golden jade spheres and lots of natural crystals. The water element is missing in this year’s chart. Therefore, boost the presence of water: wear the color blue. You can also wear black. Keep in mind that black carries a protective connotation and is yin in nature, symbolizing deep water, while blue is yang in nature and caries the connotation of energetic, moving water. Display water features, such as fountains, aquariums and ponds. Water plants also work. Make sure you display water features in the beneficial areas, based on Flying Star and 8 Mansions, aka, 8 Aspirations, methods. Use more blue colors in your decor. Blue crystals, Water drop hangings or wind chimes can be used as well. The YEAR OF THE FIRE MONKEY! It is a well-known and accepted by many fact that the unseen energy affects us in very profound, yet subtle, ways. A specific type of energy is encoded in elements of nature, compass directions, animals, colors and shapes around us. Our home and various corners/rooms in it also carry and vibrate at specific energy patterns, depending on location, surroundings, shape, color, condition, clutter, décor and many other factors. This report is born of Lada Ray’s innovative school of Personal Feng Shui​, based on the Classic Compass School. Suitable for beginners through advanced. Great value & fun to work with! Click for details and to order your personal report!